File photo of a doctor reading a blood pressure gauge during an examination of a patient. 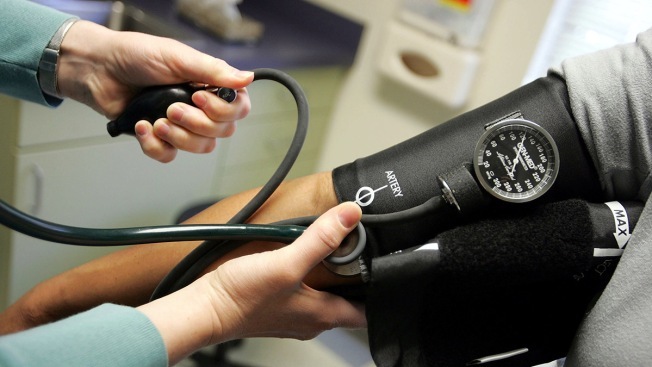 The U.S. Food and Drug Administration has expanded its voluntary recall of several medications used to treat high blood pressure and heart failure over concerns that an active ingredient in the drugs could be contaminated with a cancer-causing agent. The agency reported that traces of N-nitrosodimethylamine (NDMA), a "probable human carcinogen," was found in the active ingredient valsartan in the recalled products. The FDA noted not all products containing valsartan are contaminated and being recalled. A third-party supplied the valsartan contained in the recall. The FDA updated the list of products included in the recall and the list of those unaffected. "FDA is working with drug manufacturers to ensure future valsartan active pharmaceutical ingredients are not at risk of NDMA formation," the FDA said. "The agency reminds manufacturers to thoroughly evaluate their API manufacturing processes, and changes to those processes, to detect any unsafe impurities." If a patient is taking one of the recalled medicines, they should follow the recall instructions each specific company provided, which will be available on the FDA’s website. If a patient's medicine is included in the recall, they should contact their health care professional to discuss their treatment options, which may include another valsartan product this recall doesn't affect or an alternative option. "The FDA’s review is ongoing and has included investigating the levels of NDMA in the recalled products, assessing the possible effect on patients who have been taking them and what measures can be taken to reduce or eliminate the impurity from future batches produced by the company," the FDA said in a news release.